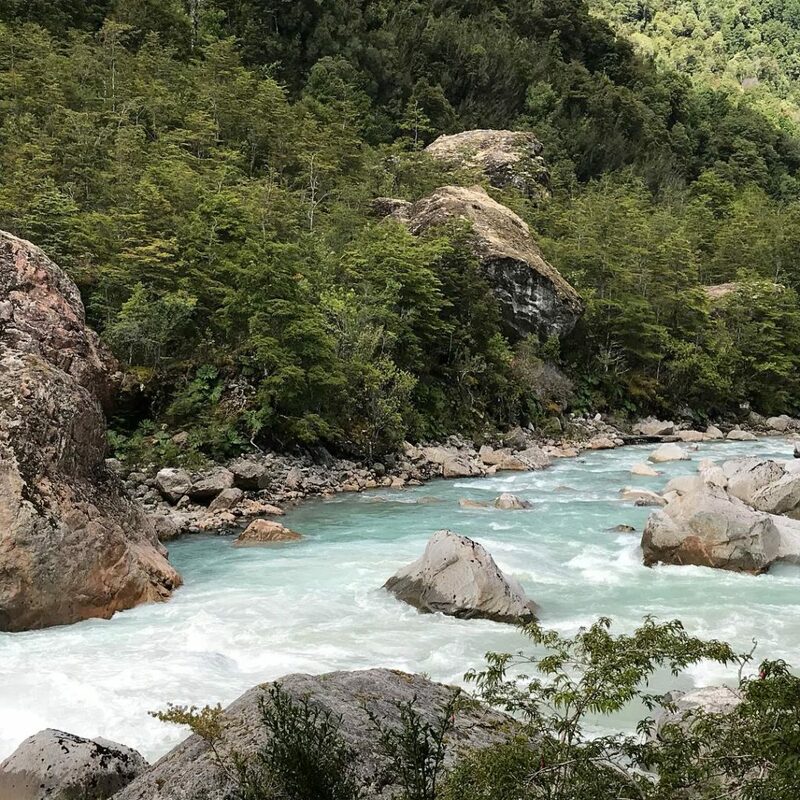 Queulat is one of the most natural and impressive National Parks in Chilean Patagonia. 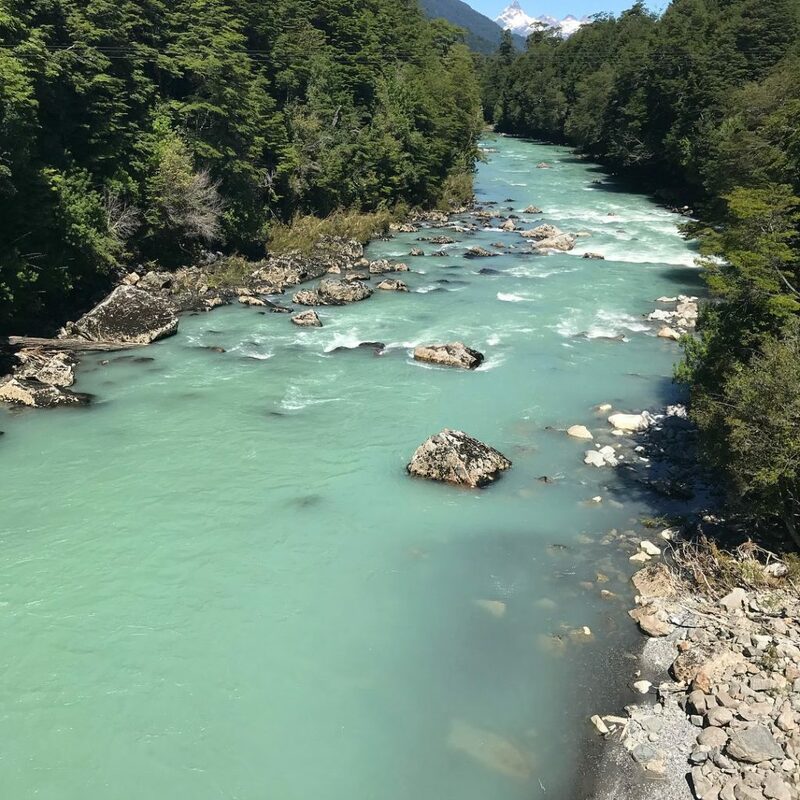 It was created in 1983, and it was inaccessible by men until the construction of “Carretera Austral” a few years ago. This is why the area remains practically untouched, which is its best characteristic at the same time. Its remote location allows visitors to enjoy nature in a great state of conservation, as you will see in all the pictures below. 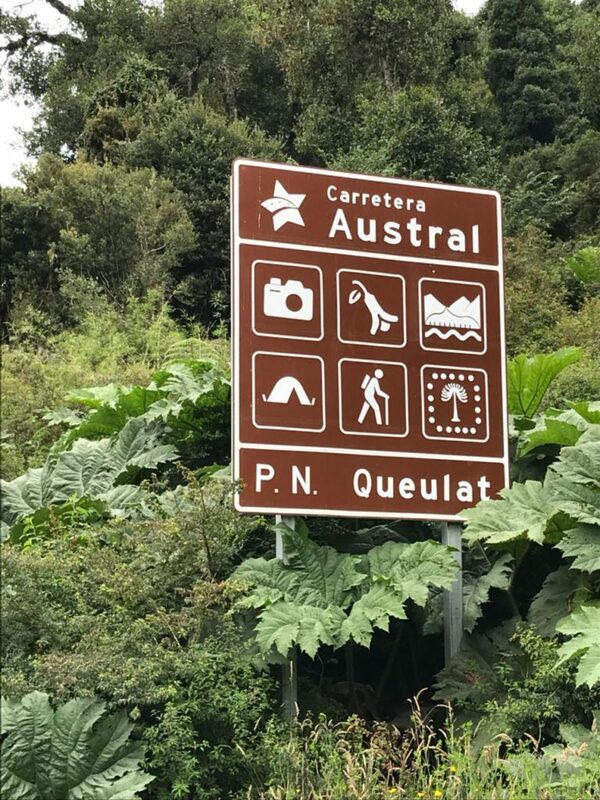 How to get to Queulat National Park? Accessing the park by car is the best option with no doubt. You just need to make sure you book one in advance, as the closest town are small and cars can easily sell out. 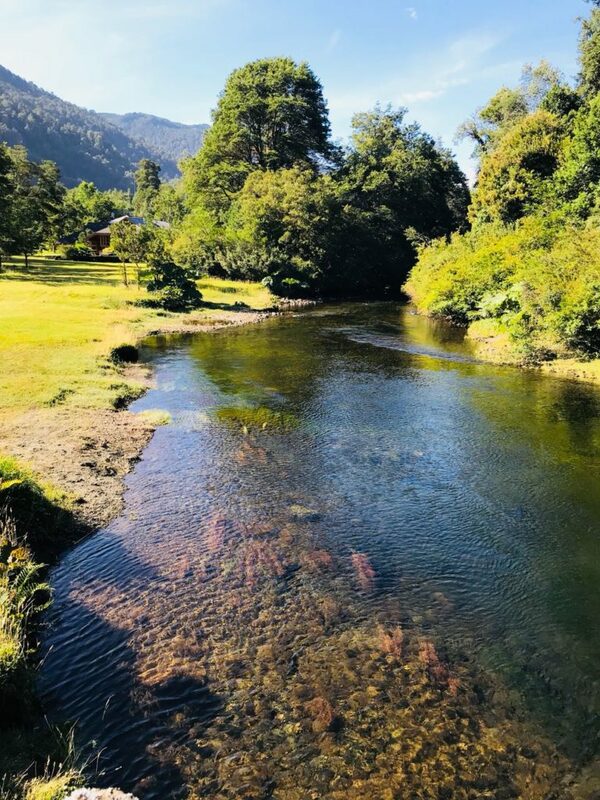 The park is situated 165 km north of the city Coyhaique and 180 km south of Chaitén, which are the best two places to get a vehicle. The closest airport is Balmaceda, which is 268 km (166 miles) away, where you can also get a car. Most people come from other cities though, sometimes from Argentina, as we did. 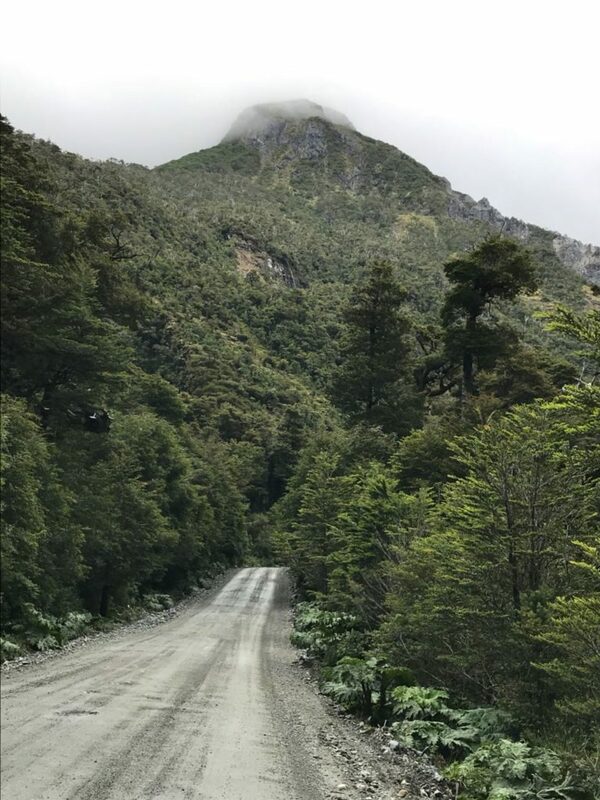 “Carretera Austral” or “Ruta 7” is the only road to access the park. It is full of vegetation, surrounded by virgin forest and extremely picturesque. Over 40 km of the road crosses back and forwards into the park, so visitors can admire the nature. Weather conditions in this area can be very tough, and the road can easily be affected. So this is something to consider when planning the trip. You should double check its accessibility even after you have everything ready because the conditions can change drastically from one day to the other. We were not lucky this time, as there was a severe mudslide in Villa Santa Lucía a month before our trip. 4.5 km of road were destroyed, and 19 people died. Of course, this is a natural disaster and it does not happen very often at all, but road closures due to weather conditions happen. The alternative in these cases is to take a boat/barge, and then take the road again, skipping the closure. 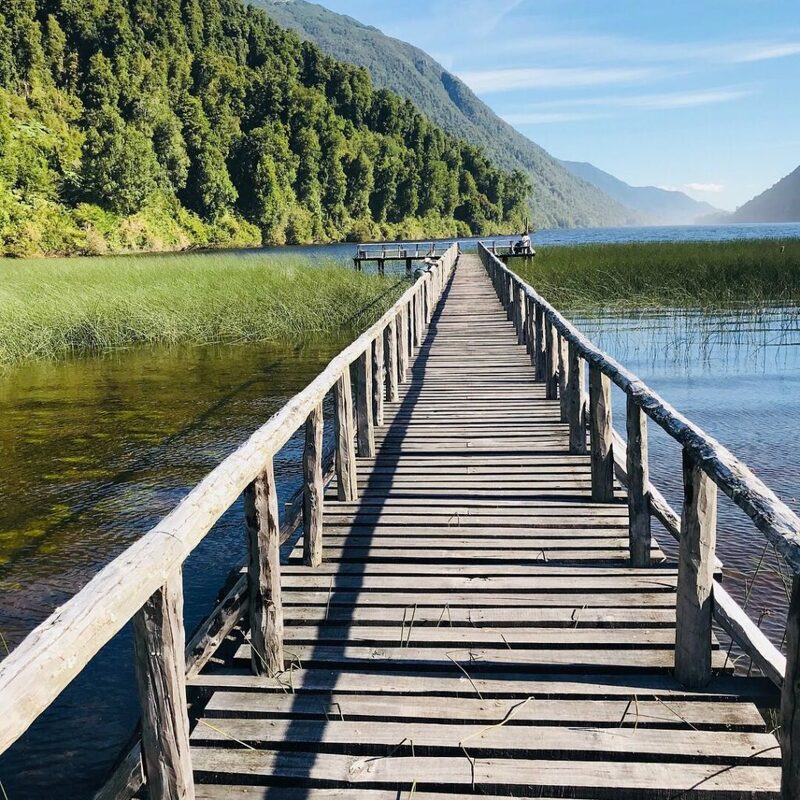 One of the places for this is Chaitén, where boats depart towards Puerto Martin Balmaceda and other towns. More information is available on the official website. 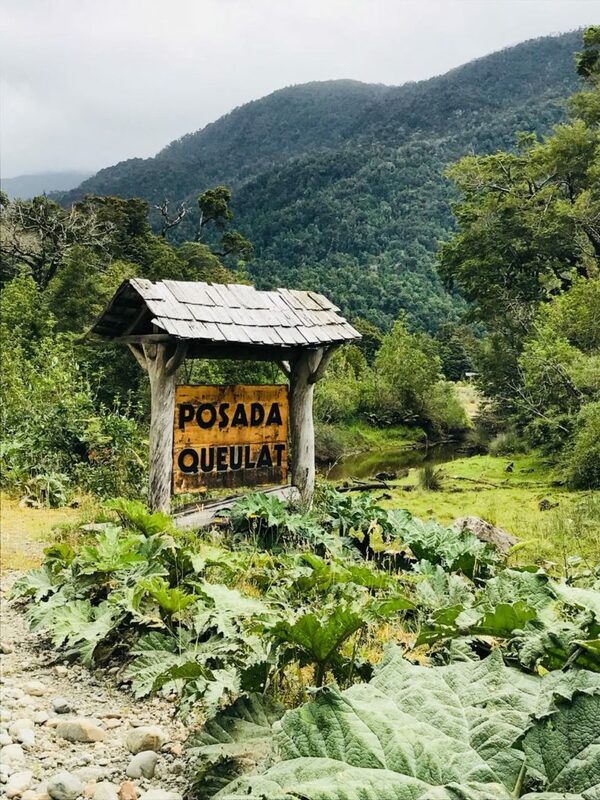 Where to stay in Queulat National Park? The closest town/village is called Puyuhuapi (Puyuguapi), and this is where most people stay. It is only 21.5 km away and takes around 40 minutes by car to get to the park. Its harbour on the fjord is called Puerto Puyuhuapi. Another small village is called La Junta, which is 66 km north of the park, and about 1 hour and 20 minutes drive. 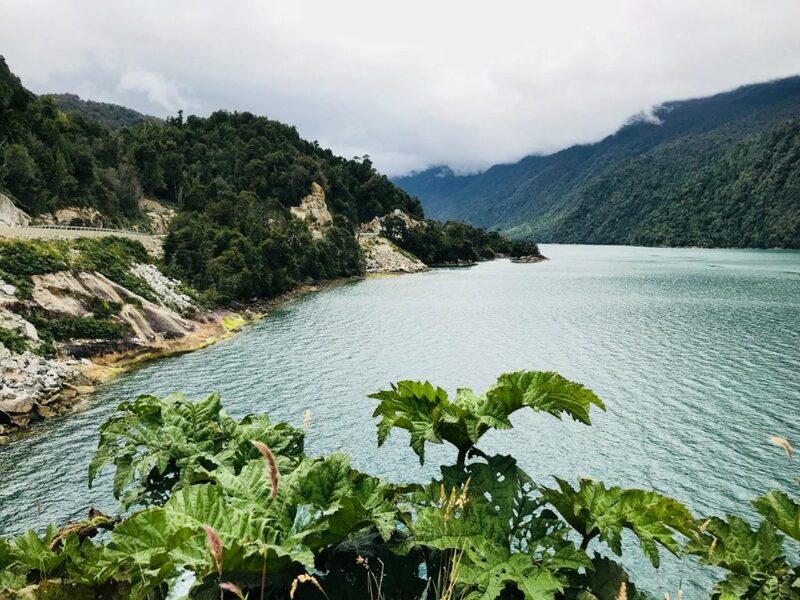 There is a beautiful lake between Puyuhuapi and La Junta, which is called Lago Risopatron. This is a quite good area to stay, natural and quiet. We did it and I totally recommend it. We stayed at Pangue Lodge, in a pretty self-catering bungalow (“cabaña” or cottage). Comfortable rooms equipped with full kitchens. Complimentary daily breakfast is also offered, and there are other facilities such as a restaurant, a bar (with billiards), a pool with jacuzzi and free WiFi. There are a few outdoor activities offered, being fishing and canoeing the most popular ones. You can also find trails for hiking and a river which is also called Risopatron. Once in the park, we stayed at Posada Queulat, which is probably the only accommodation inside the park, except for the campings. The rooms are comfortable, with private bathrooms and rustic wood furnishings. Most of them also have private balconies with mountain and garden views. The rooms have no kitchen, so the inn provides breakfast and a meal. Bear in mind that there is no electricity, gas nor mobile reception in this area. Nature prevails! The inn has a modest power generator and does not provide WiFi (it is only shared for some time in the evening). Moreover, the closest shop to buy groceries/food is 20km away, so better to buy some stuff in advance and be ready to be disconnected and enjoy nature. 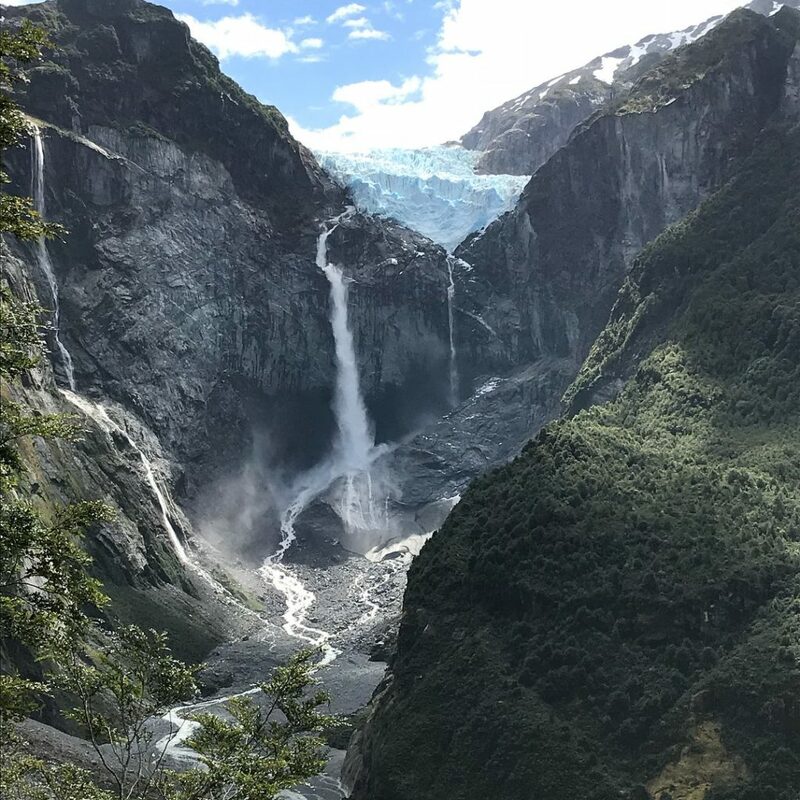 The park’s main attraction and the centrepiece is the Queulat Hanging Glacier, officially named Ventisquero Colgante (Spanish). It is one of those breathtaking places in the World that makes you stand still and admire in complete silence for a while, thinking of how minuscule and insignificant we all are as individuals. 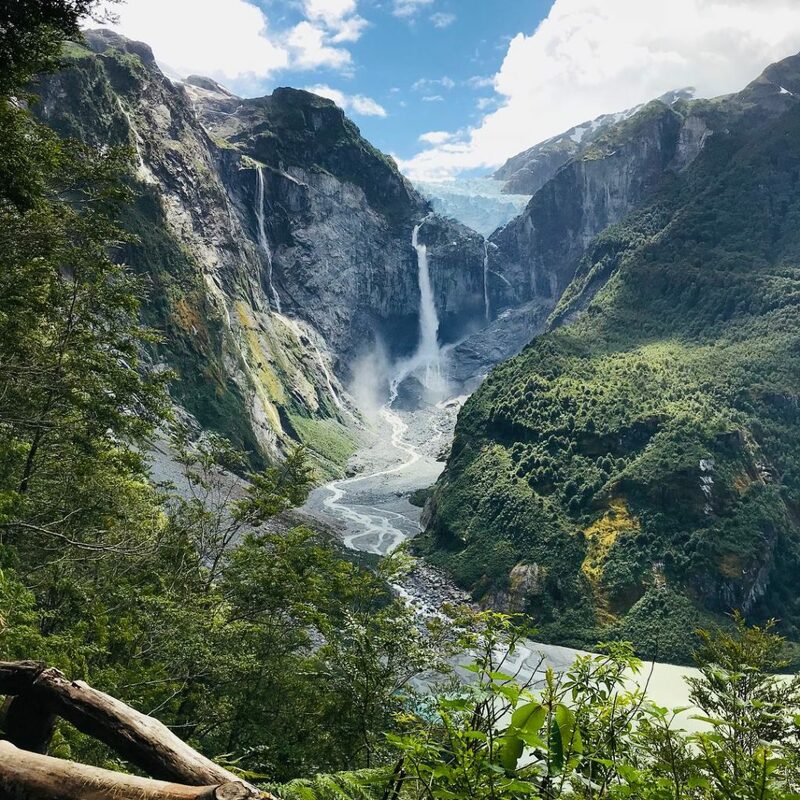 The first picture of this post and the one below illustrate this astonishing hanging glacier. However; I can ensure that face to face is a very different story. The footpath that takes you to the best place to admire the glacier (where the pictures above were taken) is also beautiful. It takes about 3 hours from the inn, but it is worth every minute. This will be one of the highest moments of the trip, so better to go slowly and enjoy. 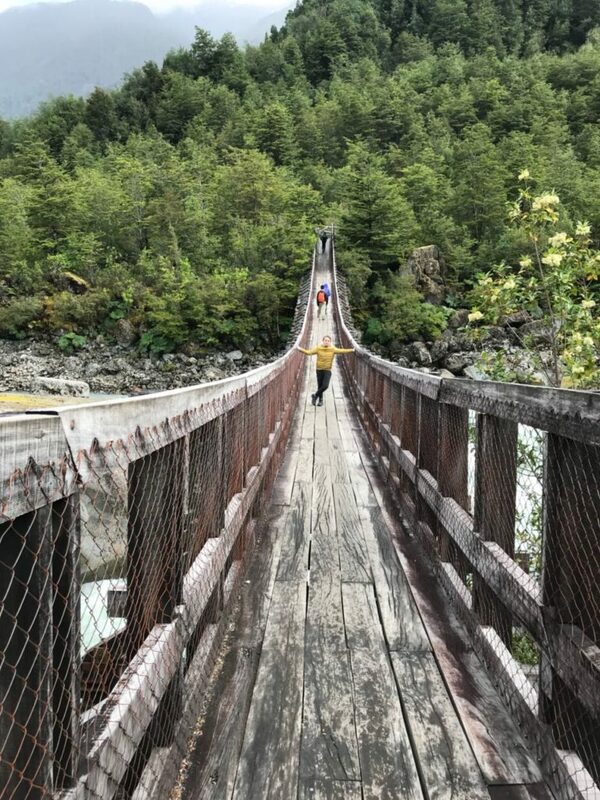 Additionally, I would suggest looking at the weather forecast for Puyuhuapi, and make sure to go on a clear and sunny day, as the glacier can be invisible behind clouds or rain. The vegetation in the park is typical of an evergreen and rainy forest, as it can receive up to 4,000 mm (157 in) of precipitation annually. Some of the species found in the park are tepú, quila, chilco and nalca, a plant with huge leaves. The fauna consists mainly of birds like the black woodpecker, chucao, huet-huet, cachaña and the kingfisher. Foxes and pumas are sometimes sighted as well. Other popular attractions are Lake Risopatron (as described above), Salto del Padre García, the Lagoon of the Pumas, the area known as la Cuesta Queulat, Témpanos Lagoon and Salto del Cóndor. 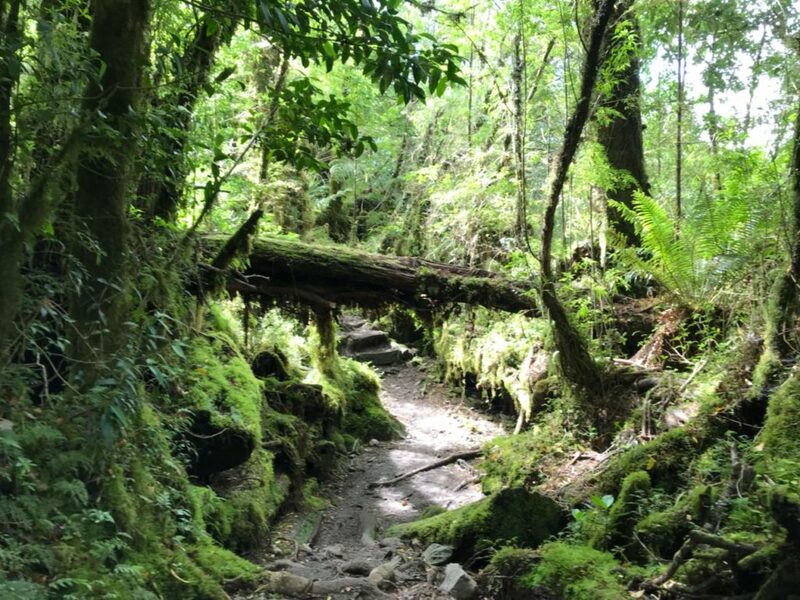 There is also another footpath/trail called “Bosque Encantado” (Enchanted Forest), but it was close to the public this time. And there are also boat trips, which are only allowed in the Témpanos Lagoon in the hanging glacier sector. Last but not least, there are a couple of thermal baths in the area. One of them is called “Termas del Ventisquero“. 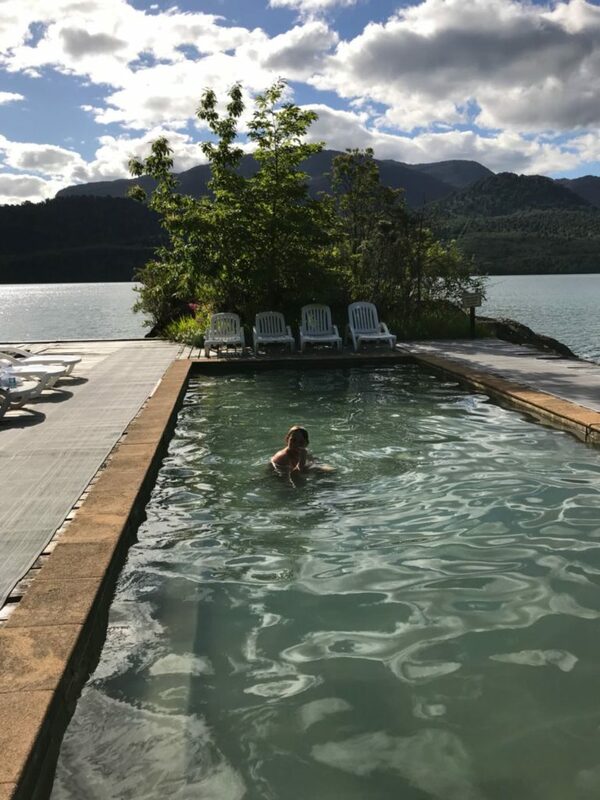 It is located 6 km south of Puyuhuapi, and offers one big pool (first picture below) and three small ones (second picture below) facing the fjord/sound. The water is 20°C to 40°C, and there are good facilities such as showers, changing rooms, lockers and towels, which are all included with the entrance fee. Other services offered are a restaurant, a bar and a coffee shop. The latter serves tasty pastries, organic coffee and English tea. More information is available on the official website. There is also a more luxurious alternative. 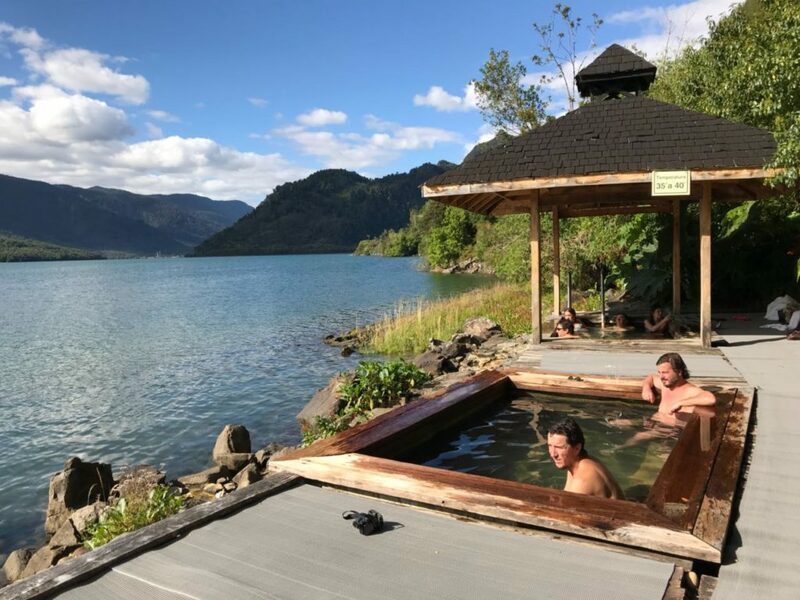 It is called Puyuhuapi Lodge & Spa, and offers an outdoor thermal swimming pool, a spa, a gourmet restaurant, a bar and on-site fitness centre. Massage sessions, hiking and canoeing excursions can also be arranged. The lodge can only be accessed by boat, which is available at 10:00, 13:00, 15:30 and 19:00. This post would not have been possible without the information and pictures provided by Florencia Iriarte. All the stunning photos above were taken by her. As you have seen, she is an outstanding amateur photographer and deserves all the credits.